Seldom you read or hear about how a certain intraday of the week could be more important to watch and trade than another. Looking at this table below, you quickly see that some days are so called up-days and some days are down-days. Revealing the numbers behind the colors will probably shock you! There are extreme differences to the performance of certain intradays. So far in 2019, if you are long the Nasdaq100 index going into Thursdays, you are most likely to see the index fall significantly through that day. 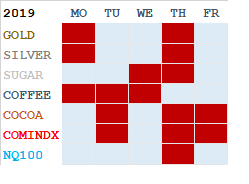 The very same is true for metals, where Thursdays are clearly the worst performing day of the week for both the Gold and the Silver. If you would like to see the actual numbers behind the Reds and the Blues, simply send an email to intraday@intraday.no and the answers will be received for free. Commodities are weakening and now trading below the February 2nd lows. 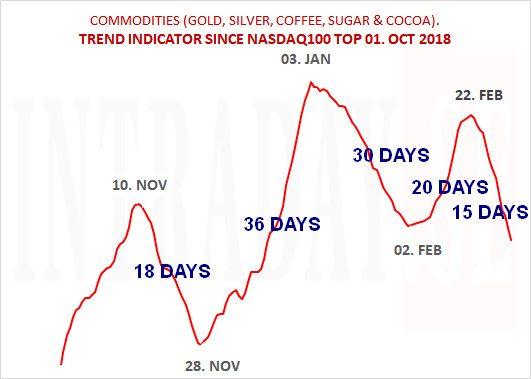 The latest peak 15 days ago was a lower high than the one January 3rd..
For 2019, Gold Silver Coffee Sugar and Cocoa are collectively - 5.3%. Since Nasdaq100 peaked for an all-time-high 159 days ago above 7.600 October 1st. 2018, the commodity index (below) is + 9.6%. As for now, commodities are trending lower (in the shorter term) until markets see renewed strength to the red line above. Make sure you stay up to date with all our posts, go to Instagram and look up the intraday.se profile (type in @intraday.se). Its moving up, its moving down, but how much is it actually moving within a certain timeframe? Trading ranges are important because they tell you how much your trade or investment may move within a certain timeframe. Many traders use trading ranges as an effecient parameter to place stop loss - and take profit orders. The table above shows how much Euro to USD, Gold- and Silver prices, the Dax index, Platinum, the Nasdaq100 index, Sugar-, Coffee-, Cocoa-, and Oil prices and Bitcoin moves within set timeframes. The currency pair Euro to USD, Gold- and Silver prices moves the least, as Sugar, Coffee, Cocoa, Oilprices and Bitcoin makes the most and solid price moves. The table shows the average trading range of the last 1.000 bars for its timewindow. '1 DAY and 1 WEEK' shows the daily and weekly trading ranges for 2018. 30 MIN more than 0.5%: Sugar, Coffee, Cocoa, WTI Oil and Bitcoin. 2 HRS more than 1%: Coffee, Cocoa, WTI Oil and Bitcoin. 4 HRS more than 1.5%: Cocoa and Bitcoin. 6 HRS more than 2%: Bitcoin. 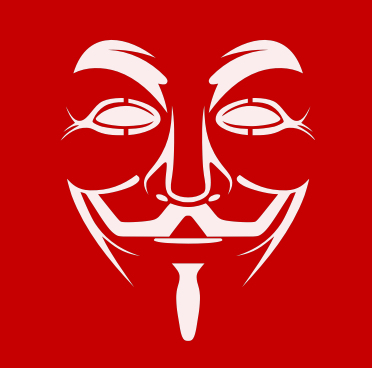 1 DAY more than 2%: Nasdaq100 index, Sugar, Coffee, Cocoa, WTI Oil and Bitcoin. 1 WEEK more than 5%: Sugar, Coffee, Cocoa, WTI Oil and Bitcoin. 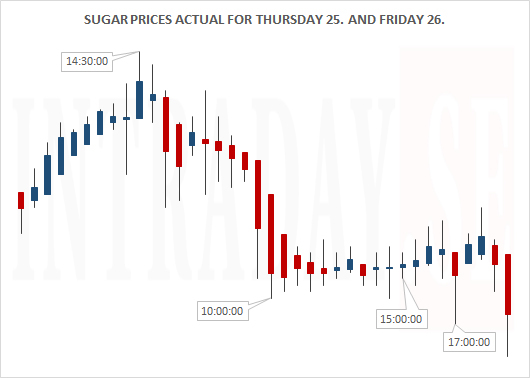 Sugar prices Thursday 25. & Friday 26th. The Sugar contracts have been trending significantly higher the last 2 months since testing August 2015 LOW levels on August 22nd 2018. When this commodity starts trending, it does it beautifully. 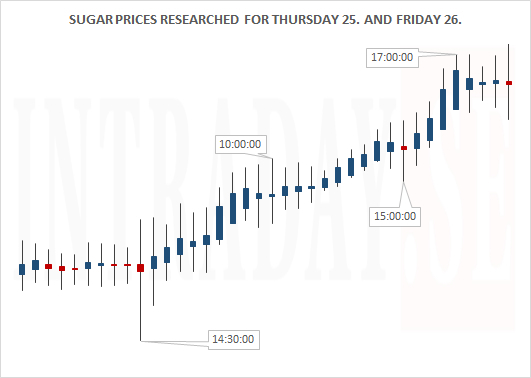 Looking towards the shorter term moves below, there is a researched intraday pattern in Sugar # 11 Futures contracts for Thursday 25th and Friday 26th linked together. A major timewindow is intended Thursday afternoon around 14:30 CEST, for then to keep trending through Friday. But you never know. Anyhow - do not fight the tape - the trend is usually your friend. Remember to keep a preferred stop loss in place at all times (average daily range is 0.35). This is a 30 minute bar chart. ...And below is the actual intraday chart for the two tradingdays. The 14:30 timewindow proved to be essential and behaved inverse to the sited map into 10 o'clock Friday. The trend from Thursday continued through Friday. 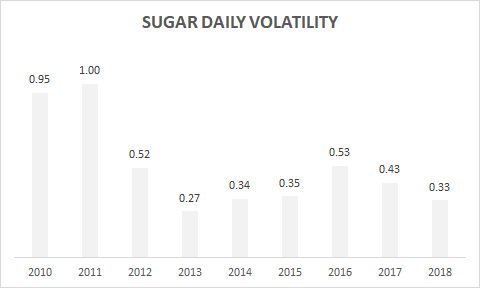 Spot Sugar’s daily trading range averages $ 0.33 or 2.61% so far in 2018, a little less than last year of 2.73%.